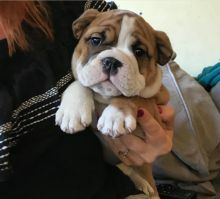 Dramatic English Bulldog puppies for Re-Homing. Raised underfoot inour home. They are very playful and great wit other dogs and would make a great family pets.They are up to date on all shots and well taken care of because we were going to keep them, so they knows some commands. They are looking for their forever homes and it must be a good home.